Now that Congress, as part of its fiscal cliff compromise, has given the wind industry a one year extension on its present tax rules, it's time to take a sober look at the real economics behind the struggle between future energy -- wind, solar, efficiency, geothermal -- and fossil fuels. During the fight over whether to increase taxes on the wind industry -- ironically led by anti-business tax Republicans -- the real issue was made crystal clear. In a letter to Congress, a group of fossil fuel supported lobbying groups, led by the American Energy Alliance and the Competitive Enterprise Institute, argued that the current tax structure for wind and solar had "already negatively impacted electricity reliability, because the artificial price structure created by the PTC encourages the development of uneconomic wind while undermining the economics of reliable, full time generation such as coal and nuclear." There it is. Coal and nuclear are reliable -- wind and solar are not. Coal and nuclear are affordable -- wind and solar are subsidized. Stick with the past. Well, let's begin with one fact that both sides can probably agree on. Producing electricity from fully amortized, old generating facilities -- whether coal or nuclear or natural gas -- is cheaper in general than producing electricity from any new facility. (In 20 years producing power from amortized wind turbines will be even cheaper, because they won't need fuel.) But that is irrelevant to the question of what kind of new facilities are most competitive and desirable. And the United States will need to replace all of its nuclear and most of its coal over the next 30 years -- much of it in the next decade. Power plants wear out. So first, are coal and nuclear reliable? That would be a big surprise to the customers of California's San Onofre plant which has been shut down now for over a year, at a cost to its owners of $317 million. And it was not evident last year in Texas when a mysterious problem not yet disclosed forced the closure of the new Sandy Creek coal plant, and threatened the reliability of the entire Texas grid in the process. And last summer, faced with hot temperatures, both coal and nuclear plants around the nation had to be shut down because they couldn't operate in the heat. Cheap? Ask the North Dakota farmers whose co-op invested $437 million in a brand-new coal plant, Great River Energy, and then having completed it, found it could not afford to operate it and shuttered it unused. Or query why the only circumstances under which American utilities will build nuclear power plants is if they both get 90 percent federal loan guarantees and are permitted by state regulators to charge their customers, not their shareholders, for the costs of construction. Florida Power and Light, under this doctrine, sunk hundreds of millions of dollars into preparations for building new nuclear plants that it freely conceded it might never need. Absent such subsidies, utility executives freely conceded they can't afford new nuclear plants. Cheapness is not the only economic advantage wind and solar bring to the electricity sector. They are already generating huge numbers of new jobs and supply chains. 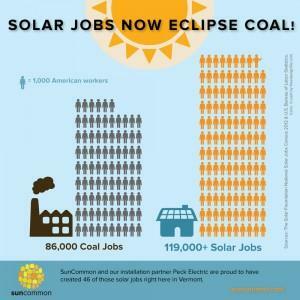 In fact, as this chart shows, the United States now has more solar jobs than it has coal jobs. And wind in particular has been generating huge new manufacturing opportunities and supply chains. In only a few years the domestic component of wind turbines erected in the United States soared from 25 percent to 50 percent. In a political year in which both parties claimed they wanted to bring back American manufacturing, it was clinically insane for Congress to almost shoot in the head the fastest growing manufacturing sector in the American economy. were serving the natural gas drilling, production and processing business -- and what they learned from the natural gas industry often transferred and was usable in the wind energy sector. At the same time, some companies found their experience in wind energy positioned them to serve the oil and gas market. But that victory came with huge losses. During the year that Congress dickered, huge portions of the American wind manufacturing sector shut down. While last year's wind installations were a new record, much of this was because companies raced to finish projects fearing tax increases for new projects in 2013 -- and far fewer wind farms and their jobs and power will come on line this year in the resultant famine. The United States exacerbated its reputation as a clean energy-hostile business environment. And the inability of Congress to make normal compromises led to deep splits between wind manufacturers, developers and some of their previously sympathetic utility allies. All of these wounds will encourage the fossil fuel industry and other renewables opponents to keep trying to tax clean energy to death -- even as they aggressively defend the even larger tax support that goes to their industries. Indeed, fossil fuel subsidies in the United States and other rich countries run five times the level of their investments in financing climate protection globally. And yet we can expect a continuation of the drum-beat from the fossil monopolies that providing $4 billion a year in support for new energy technologies is a bad deal, and that instead we should keep pouring $10 billion a year, for example, into big oil. A veteran leader in the environmental movement, Carl Pope is the former executive director and chairman of the Sierra Club. Mr. Pope is co-author -- along with Paul Rauber -- of Strategic Ignorance: Why the Bush Administration Is Recklessly Destroying a Century of Environmental Progress, which the New York Review of Books called "a splendidly fierce book."